Macedonian Kingdom, Demetrios Poliorketes, 306 to 283 BC. 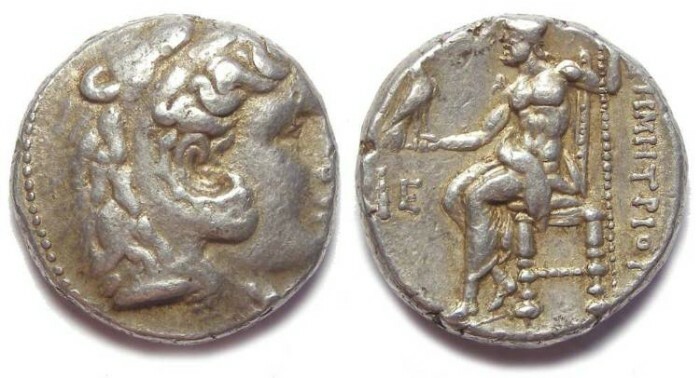 Silver tetradrachm of the Alexander style (RARE TYPE). Denomination : Silver tetradrachm. Mint : Tyre. Date : ca. 306 to 283 BC. Size : 24.4 x 24.8 mm. Weight : 17.15 grams. Grade : VF but the obverse is slightly off-centre. Reverse : Zeus seated left, holding a sceptre and eagle, with DHMHTRIOU to the right, with an E beside a club, below his arm. While a lot of Alexander style tetradrachms were struck during this period, most of them were in the name of Alexander and it is rare to fine one struck in the name of Demetrios Poliorketes. Provenance : ex Darcy Phelan collection. ex : AG auction 29, lot 604. ex : Kunker auction 97, lot 496.